The United States has a history of unthinkably cruel polices including slavery, Native American genocide, and the internment of Japanese Americans during World War II. We can now add to that the inconceivable cruelty of separating and incarcerating children, some infants, from their parents who are seeking asylum and/or a better life for their families. The irony here is that in doing this, Donald Trump (and the cries of a six-year-old imprisoned Latina girl calling for her mother) may have awakened a sleeping giant, the Latino community, capable of ensuring Democratic control of the Congress in 2018 and Trump’s defeat in 2020. There are approximately 27.3 million eligible Latino voters in the United States; about 15 million of whom are in California. Of registered Latinos, 63 percent are Democrats. However, significant numbers of eligible Latino voters (41%) did not vote in the 2016 presidential election. While traditionally the top issue for Latino voters has been the economy, recent studies suggest that President Trump might have changed that. Polling indicates President Trump and his anti-Latino comments and policies have replaced the economy as the 2018 motivational issue for voters of Spanish heritage. 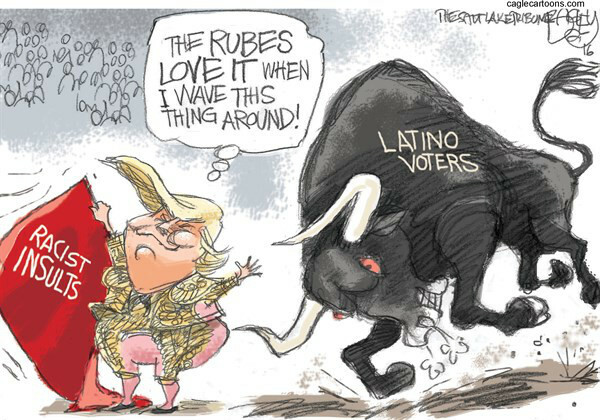 According to a Pew Research Center analysis, 75 percent of Latinos who are registered to vote have discussed Trump’s anti-Latino behavior and policies with their friends and families, raising expectations they will vote on these issues in 2018. This conclusion is supported by the Public Policy Institute of California which found 82 percent of Latino voters oppose building the “wall,” with 78 percent disapproving of the way Trump is handling his job. If this voting group mobilizes, they have the motivation and numbers to flip a substantial number, if not all, of the 14 Republican seats now held by California Republicans and ensure the re-election of California’s 39 Democratic members of Congress. The 2018 mid-term elections will be a referendum on Donald Trump and the Republican-controlled Congress, which for the most part has supported his anti-Latino racism, rhetoric, and policies. Latino voters can respond at the ballot box by voting for Democrats in 2018 and placing a congressional check on this president’s reckless behavior.